Hamza uses the occasion to once again warn that the Shiites are expanding throughout the Middle East, including “toward the Two Holy Places,” meaning Saudi Arabia’s holy mosques. He accuses the Saudi government of being incapable of stopping this Iranian-led expansion and he calls upon Muslims to support the jihadists’ cause in the Arabian Peninsula. The younger bin Laden clearly has Al Qaeda in the Arabian Peninsula (AQAP) in mind, as the al Qaeda branch has been leading the Sunni jihadists’ fight against Iranian-backed Houthi rebels in Yemen for years. The Islamic State also has a presence in Yemen, but al Qaeda rejects its claim to represent a true caliphate. AQAP has repeatedly sought to undermine Abu Bakr al Baghdadi’s project, though some jihadist figures in Yemen have worked for both organizations. In addition to alleging that the Saudis cannot contain the Shiites’ expansion, Hamza attempts to undermine the ruling regime’s legitimacy by pointing to its historically close ties to the West. This, too, is a theme he has explored in previous episodes. Al Qaeda has once again decided not to show Hamza’s face. His message was disseminated as an audio file spliced together with various video images. As FDD’s Long War Journal first reported last year, Hamza’s wedding video was found in a massive cache of files recovered in his father’s Abbottabad, Pakistan compound. That video shows Hamza as a young man and, once it was released, provided the public with the first images of Hamza since his childhood. Previously, al Qaeda recycled the same childhood photo of Hamza time and again, but failed to distribute a more current image of him likely due to security concerns. 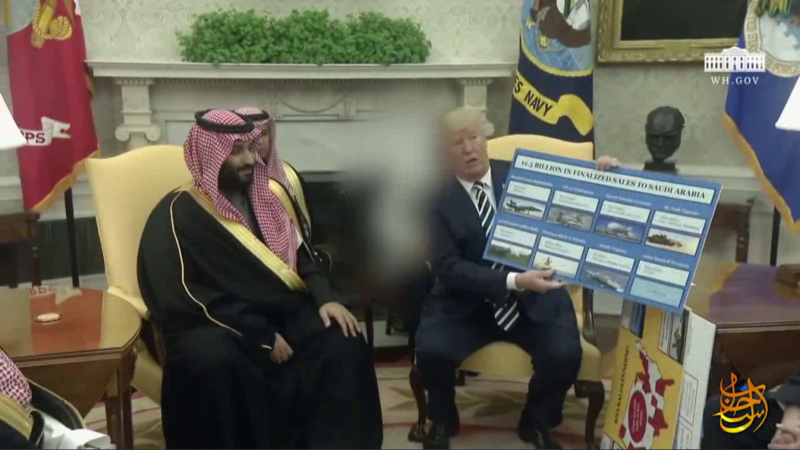 Although bin Salman’s comments were self-serving, and the Saudi kingdom has its own history of sponsoring Sunni extremism, it is true that Iran harbors some al Qaeda leaders, despite their ideological differences. The Obama administration repeatedly pointed to an “agreement” between Iran and al Qaeda that allows the terrorist organization to maintain a “core facilitation pipeline” on Iranian soil. Both the US Treasury and State Departments have identified a number of al Qaeda figures responsible for runing this pipeline, which Osama bin Laden himself described as the “main artery” for his organization. Hamza bin Laden himself lived in Iran for years after the 9/11 attacks. The wedding video released last year was recorded in Iran. Although that footage doesn’t demonstrate that Hamza was under any duress at the time, his confinement inside Iran later became a point of contention between al Qaeda and the Iranian regime. Al Qaeda agitated to free family members and others held in Iranian custody, and even kidnapped an Iranian diplomat in order to force an exchange. Hamza was finally released from Iranian custody sometime in mid-2010, making his way to northern Pakistan, where he received specialized training. His current whereabouts are not widely known. It is possible that he has returned to Iran at times, but that hasn’t been confirmed. 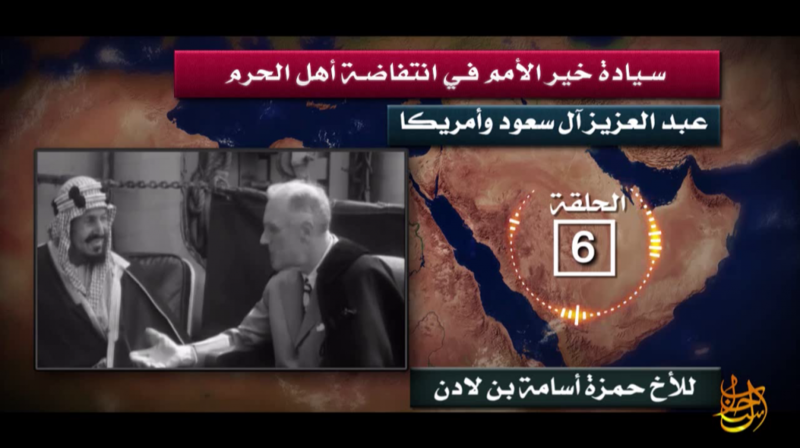 Regardless, Hamza’s message is clearly intended to remind viewers that al Qaeda and Iran are on opposite sides on the war in Yemen, as well as other conflicts throughout the region. And he wants to use anti-Shiite sentiment to stir up more support for the Sunni jihadists’ cause, including inside Saudi Arabia. At-Tamkin Media, an online propaganda outfit, has translated multiple al Qaeda messages into English over the course of the past year. These messages include those produced by Ayman al Zawahiri and Hamza bin Laden. Some of the quotes in this piece come from At-Tamkin’s translation of Hamza’s latest speech. I’m not sure why we didn’t flatten the bin Laden compound in Abbottabad. After ensuring that we had Osama, we should made sure that none of his family lived to fight another day. Critical mistake by the Obama Admin. Yep. There is only one thing for it – a Shiite Sunni all out war. Hurry up and get on with it. This is the first time I have been on your site. I learned new information about Hamza that I did not know before; he is married. I started my own journey of educating myself about “All Things Islam” when Barry (B. Obama) pulled out of Iraq without leaving any residual forces in place. The other reason I chose this journey of education was Barry refused to call the enemy by name; constantly chastised Christians, allowed ISIS to flourish in the Middle East, and did nothing to stop the genocide of Christians, or the torture of other Moslems who did not accept or follow the tenets of Sharia Law. So, I will continue to read articles from your site to expand my education.